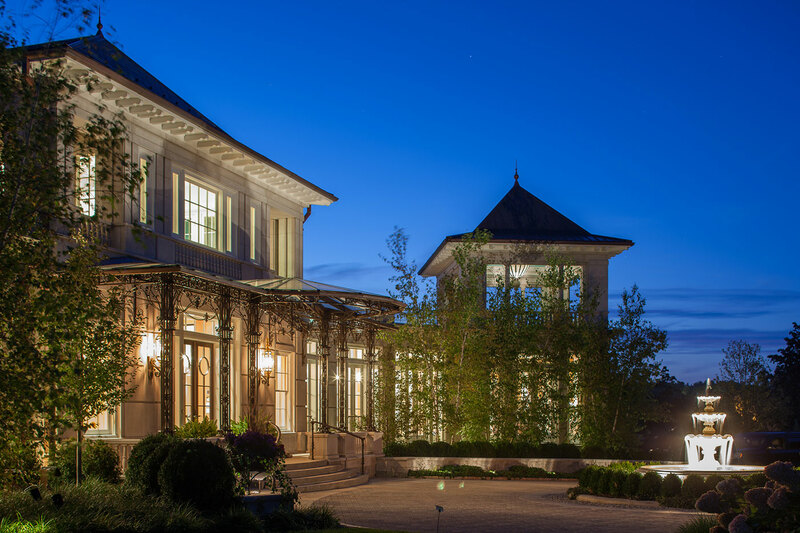 The general contractors we feature at Boston Design Guide regularly complete some pretty spectacular properties. We got to thinking about the project they would say represents their firm’s finest work, a builders’ Honor Roll, of sorts. Here are the projects given high marks. 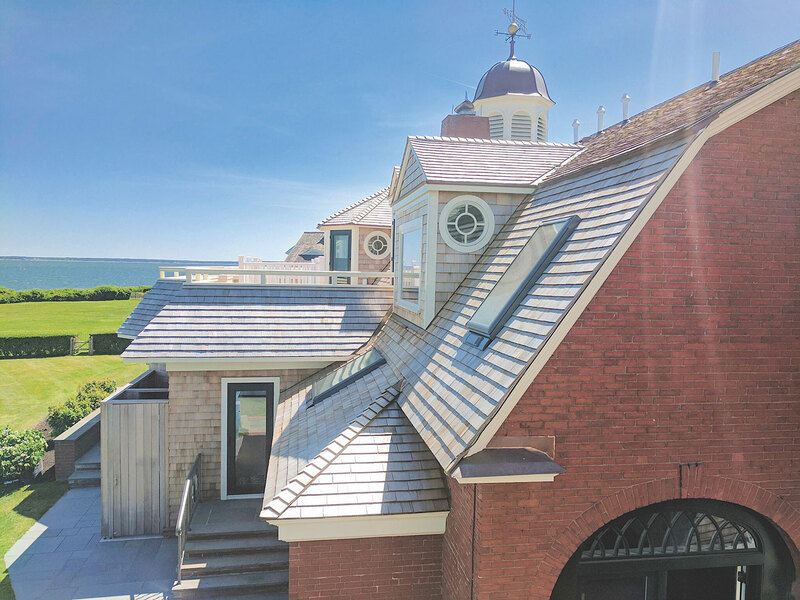 A wildly unique renovation in Manchester-by-the-Sea gets the nod from Kistler & Knapp Builders as one of the most complex and detailed projects the firm has done. The home was clearly designed for entertaining—family, friends and business associates—and is as imaginative as it is opulent. Principal Doug Stevenson cites the front canopy and intricate ironwork as some of the most complicated work of the exterior. 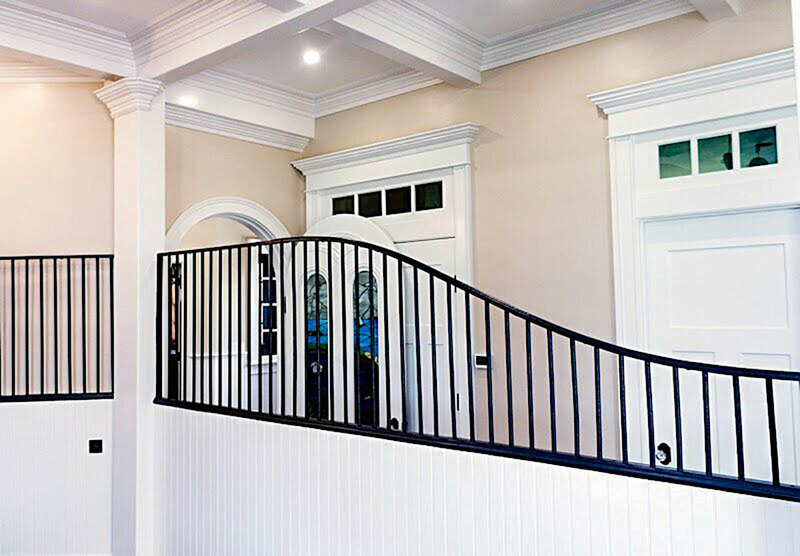 The glass panels above the stair and the elaborate ironwork that wraps the front entrance like ivy called for a meticulous level of care from both the builders and metalworkers. 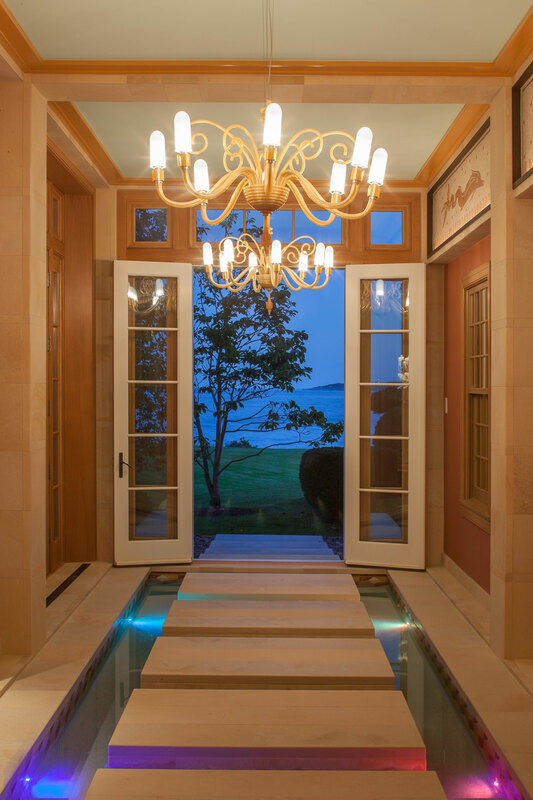 Once inside the home, the foyer’s lap pool (complete with a footbridge overpass) and 18-inch deep reflecting pool that steps out to the sea (shown above) represents what Stevenson calls “some of the most technical work that we’ve done.” Laden with wood, mosaic tile, limestone and the dual interior pools, the reception hall required HVAC systems that were spot-on from both a design and installation standpoint. 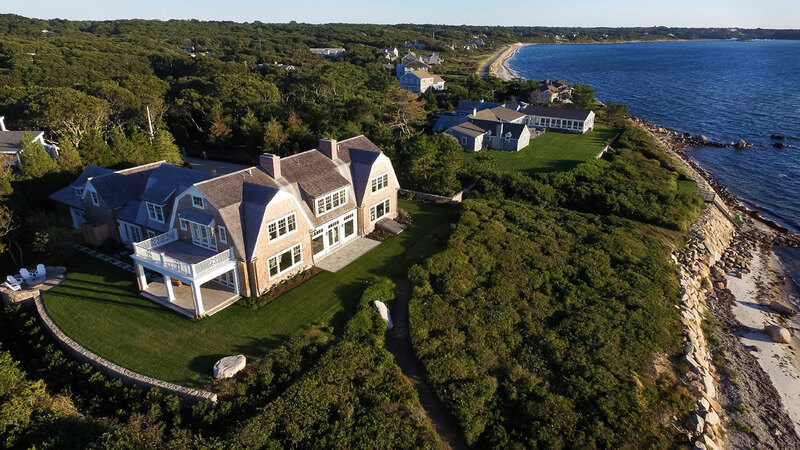 While a new construction, the home is very much in keeping with its site and boasts “that great Cape Cod detail,” says Cataldo, i.e., gambrel roofs, red cedar shingles, copper gutters, chimneys and composite trim—all of which will weather beautifully. The home’s interior details shine just as brightly. The home boasts ten-foot ceilings, sun-splashed spaces with transom windows, custom bookshelves and window seats, immaculate tile work and views from every room. 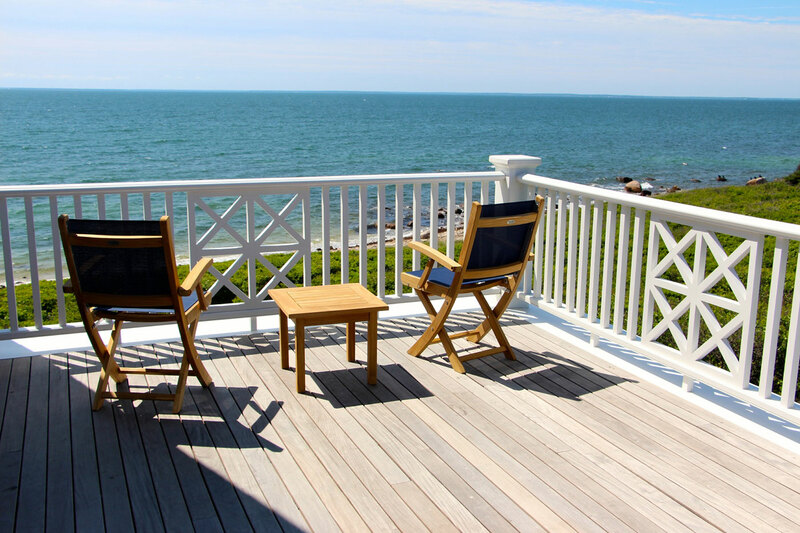 Exterior decks afford beautiful—and private—seaside views. The homeowners certainly have their own slice of paradise. When you approach the home, shares Cataldo, “it’s like you enter your own little estate. There is no one around.” At night, the residents experience incredible westerly sunsets, he continues. “It’s worth sneaking on the property just to watch,” laughs the builder. 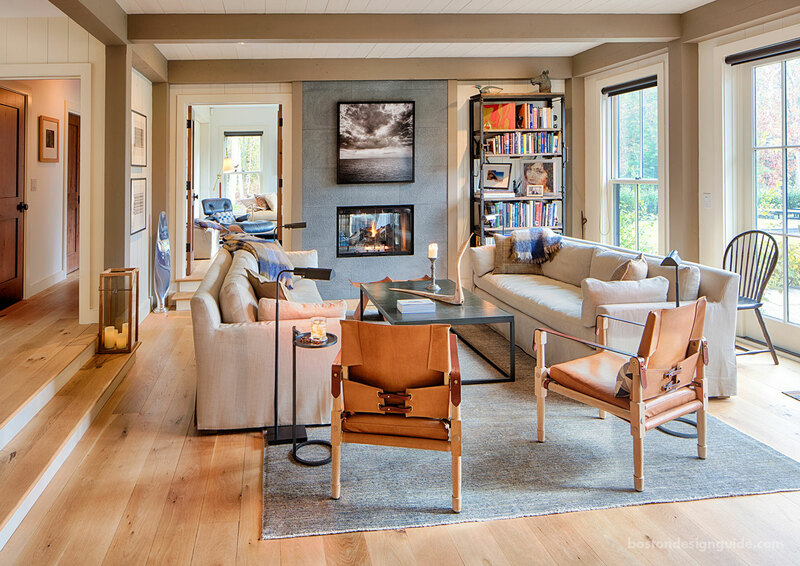 Longfellow Design Build is particularly proud of a transformation made to a historic 1860s carriage house in Falmouth overlooking Vineyard Sound. What makes the project unique, shares Marketing Director Mike Ciolino, “is the care and detail that went into the repurposing of the architectural design elements.” Things like barn doors, wrought-iron horse stall dividers and even a copper water spigot hearken back to the structure’s former use as the home for the family horses. 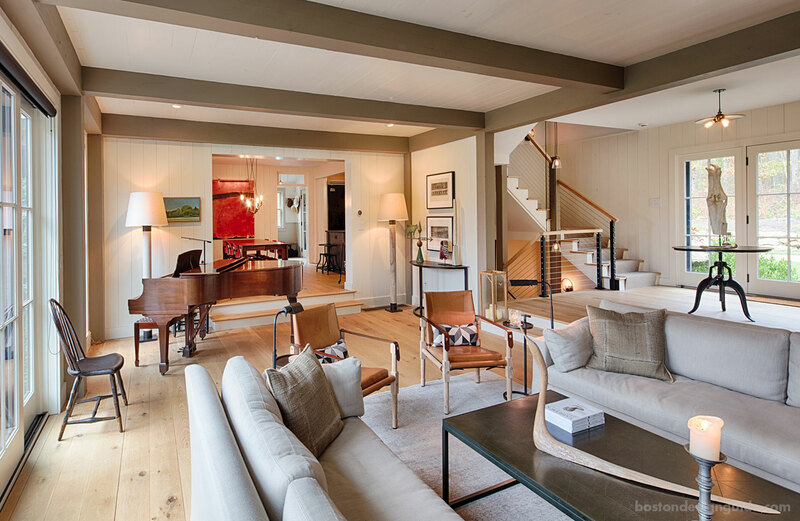 Like most Cape Cod buildings typical of that time, this building has a smaller footprint, so Longfellow was charged with creating a summer retreat that would live large, and satisfy the needs of the current owners’ modern family. 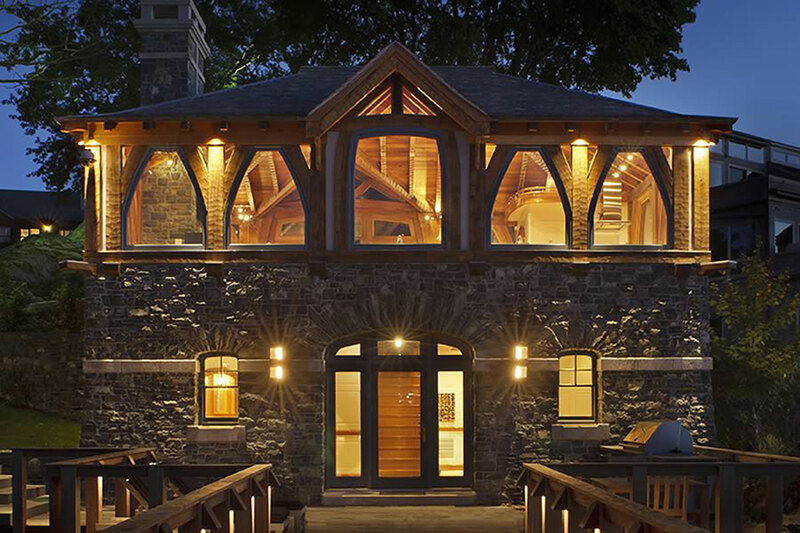 The company’s architectural designers had to think creatively about the available space—the width of the original carriage house was roughly 40 feet wide—and called for elements like a dual-purpose pantry/passageway and a 10-foot kitchen island with a curved walnut top and marine oil finish that gives the homeowners the space they need. Wrought-iron railing from the former horse stalls was used as a bedroom railing. The renovated home is riddled with charming details that add character and recall the past, as well as updates that complement the original rustic, brick and wrought-iron elements. The designers also couldn’t resist bringing in features befitting the home’s waterside vantage. Case in point? 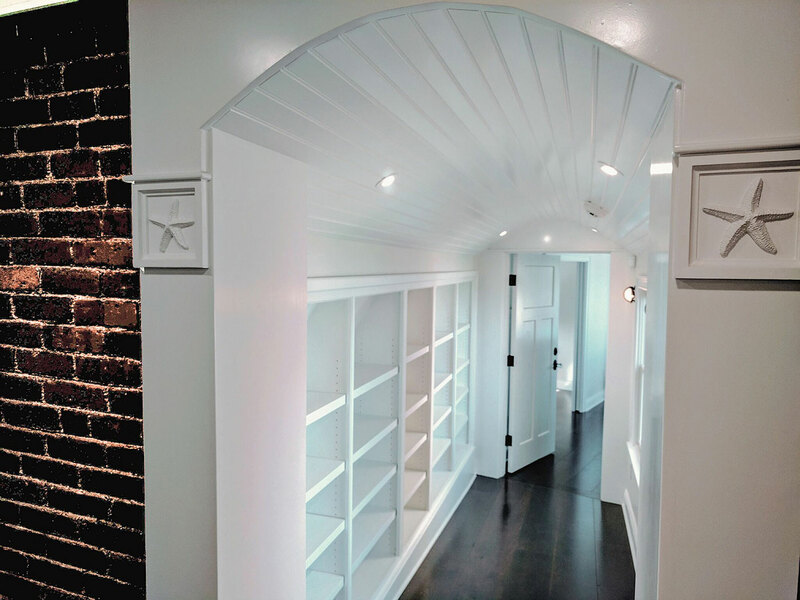 A guest suite (complete with its own kitchen) is connected to the main house via a bookcase-lined corridor reminiscent of a ship’s gangway, pictured below. 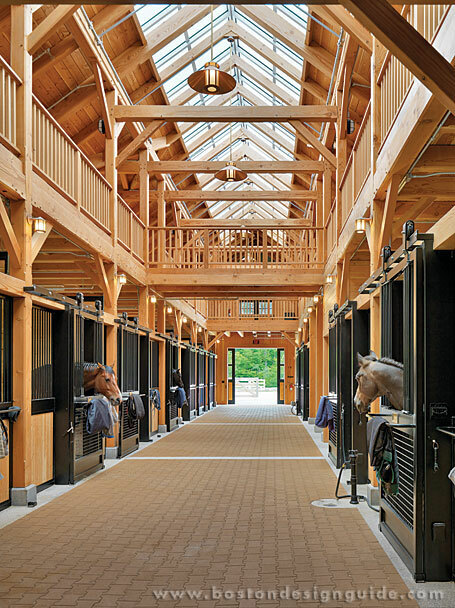 One of Kenneth Vona Construction’s most sensational projects isn’t a residence at all, but rather a private three-complex equestrian center in Weston that includes a riding arena, service barn and horse barn configured around a central stone courtyard and flanked by an outdoor riding ring. This trifecta is “a study in stone, timber and metal,” shares architect MGA | Marcus Gleysteen Architects, that marries traditional agricultural materials with contemporary building techniques. And it is stunning. 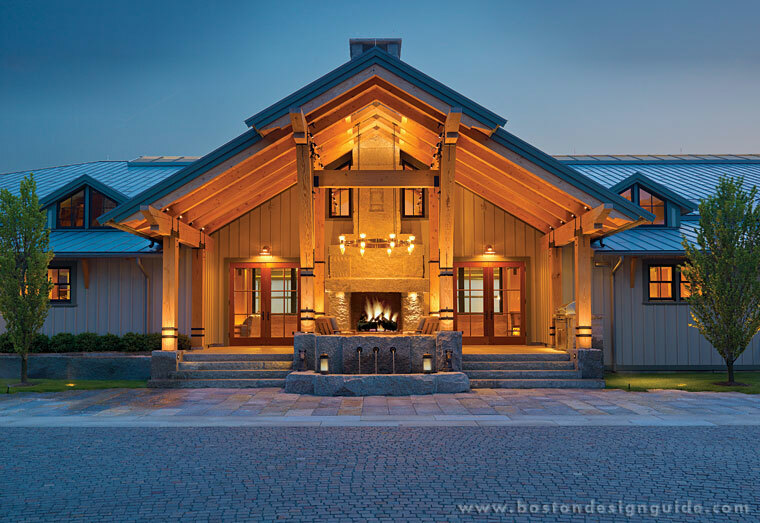 While the service barn serves as the public face of Beechwood Stables, it’s the arena’s entryway, with its massive granite fireplace, water feature and Douglas fir columns that is most striking. There is a rustic majesty to the façade that continues in to an observation room overlooking the arena. 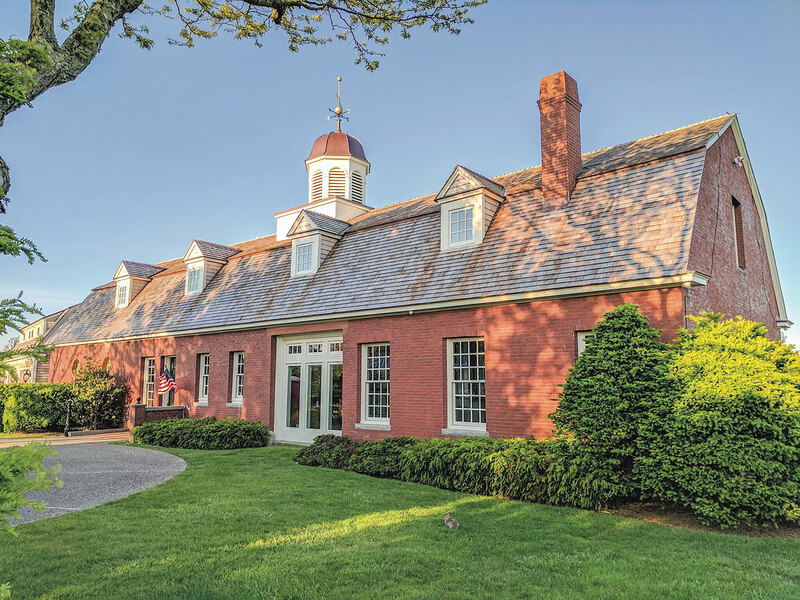 The stables, too, are a sight to behold—and every bit as noble as the animals within—with an upper tier hayloft and skylight that runs the length of the building. Yankee Barn Homes (YBH) loves how this hybrid post and beam home on Martha’s Vineyard brings the “barn home feel into the 21st century.” Created for entertaining friends and family, the design uses the post and beam vernacular “tastefully and sparingly,” explains Marketing Administrator Molly Ferrante, to create just the right look and feel for the five bedroom, five bath island home. The result is a light-filled and airy layout with a style that has both a beachy simplicity and sophistication, with plenty of gathering spaces inside the home and out, including a terrace off the spacious sitting room, second-floor decks and a screened-in porch. 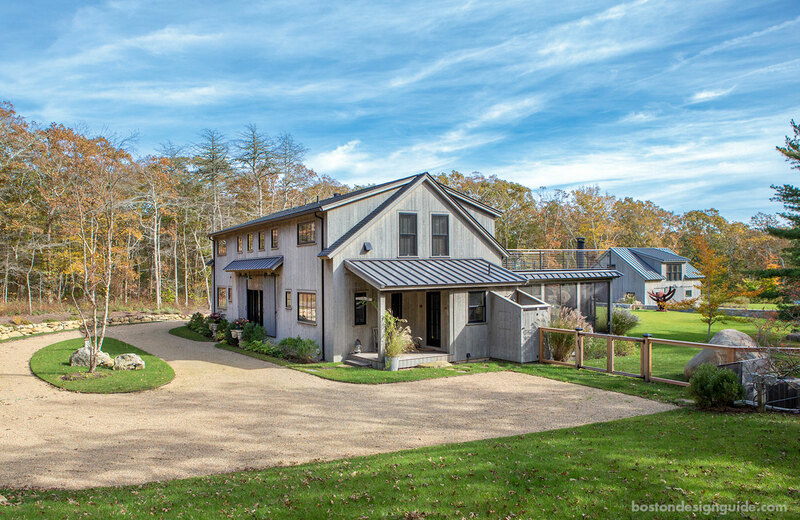 Strict building codes on Martha’s Vineyard don’t make new constructions easy, but Yankee Barn Homes was thrilled to design and ship a weather-tight, energy-efficient home that passed with flying colors. Add in a sparkling swimming pool and a second small YBH barn with an extra guest bed and bath on the top level, and you’ve got a singular vacation destination. 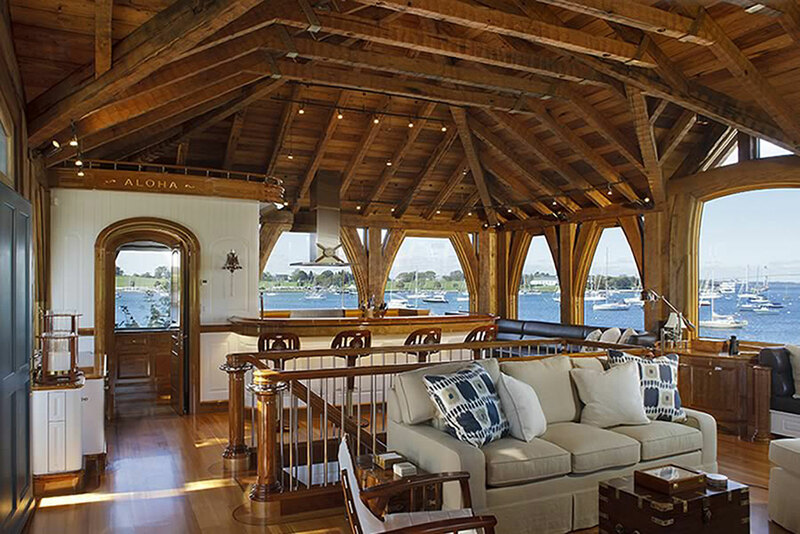 Kirby Perkins Construction is known for building luxury homes of magnificent size and scope, but, while on a smaller scale, there’s no denying the firm’s prowess on the Aloha Landing boathouse restoration. 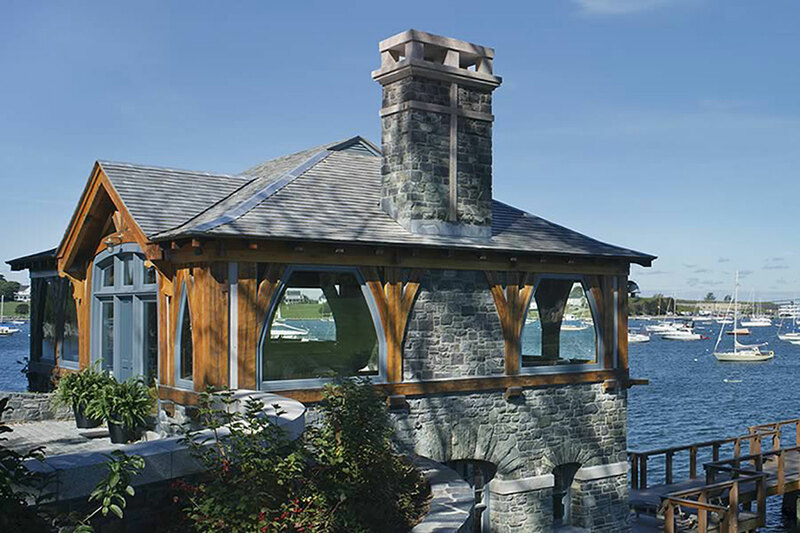 In fact, the gleaming Narragansett bayside structure was awarded the 2013 Doris Duke Preservation Award, and feted for its high degree of care and quality by the Newport Restoration Foundation and the City of Newport. The boathouse, which once housed Aloha, the three-masted schooner of railroad magnate Arthur Curtiss, is among Newport’s most iconic structures. In order to restore it, explains co-owner Tom Perkins, “we took it all apart and put it back together again, using all numbered original rock.” The upper timbers had to be made new, so the firm took antique wood, and carved all new post and beam and finished it by hand to make it look exactly like the original. Aloha Landing is poised by the lapping waves of the harbor and accessible by land only by a tiny meandering stone drive that is so slender the builders put in a cobblestone turnstile that slowly spins cars around to position them for departure. After all, you’re meant to come by boat. 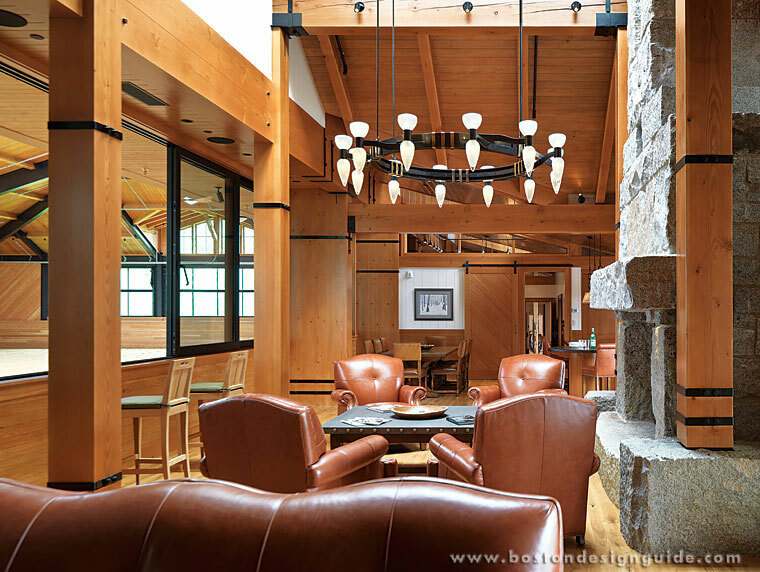 Fittingly, the interior is fashioned with oak beams, varnished teak trim and authentic yacht hardware, not to mention the handiwork of a parade of top-tier metal workers, stone masons, woodworkers, carvers and interior designer Kim Kirby. The idea was to give its residents the feeling that they were aboard a classic boat and who better to achieve that goal than Kirby Perkins Construction, which is helmed by two-time America’s Cup winner Jerry Kirby, and Perkins, who is also a sailor in his own right. 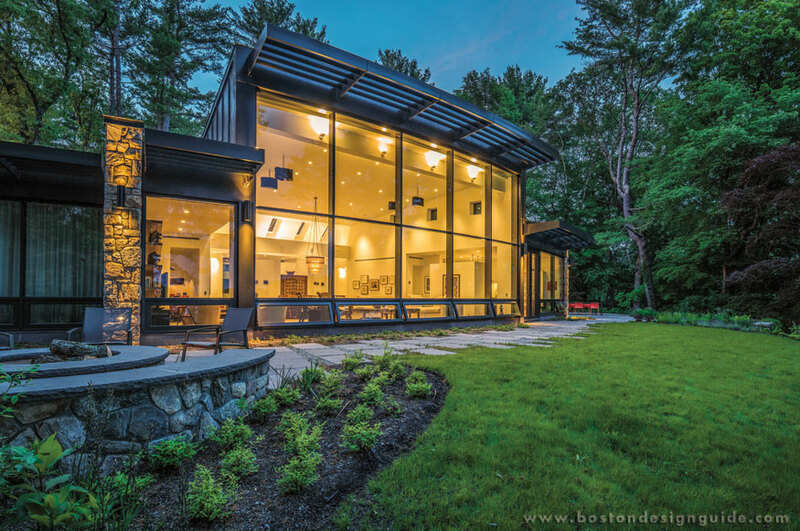 Merz Construction’s site-specific contemporary home in Carlisle, a vision in New England fieldstone, glass and aluminum, is a brilliant example of the firm’s prowess. While Pisani + Associates Architects designed the home to commune with its woodsy riverside terrain and be low-maintenance for the homeowner, from a construction standpoint, it was anything but. Built on a radial grid pattern to meet conservation standards and add interest to the interiors, the gently curving home boasts only three angles. 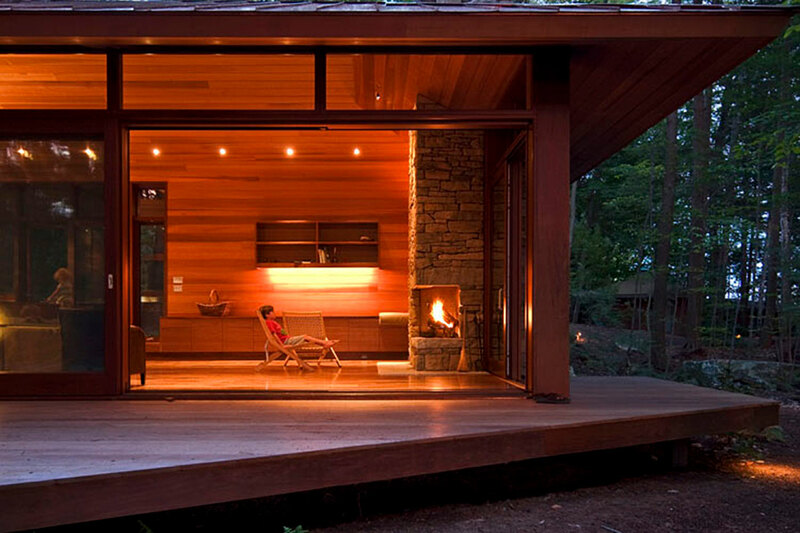 It also features a glass curtain wall with jaw-dropping, unimpeded views of the Concord River. A brise soleil shades the southern glass façade just a bit, and casts dramatic shadow patterns within the striking clean-lined interior. 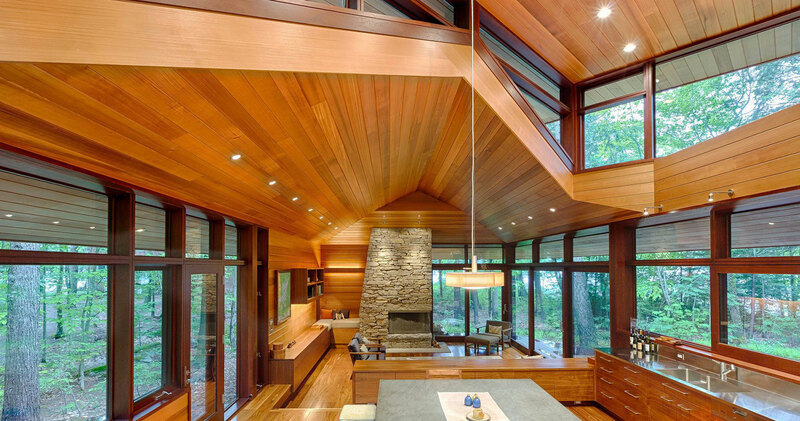 Wood & Clay, Inc.’s award-winning guest home in the Lakes Region of New Hampshire channels the organic architectural tradition of Frank Lloyd Wright and even, we would add, pays it forward. Designed in harmony with the family’s main home a short distance away, this striking guest property was designed to “have minimal impact on the lot’s natural beauty,” shares the family-run general contractor. The virtuosic structure, a study in scale and proportion, nabbed the Merit Award for Excellence in Architecture by the New England chapter of the American Institute of Architects (AIA), and it isn’t hard to see why. Laden with generous swaths of glass, gleaming black walnut floors and inspired built-ins, this streamlined home is a brilliant showcase of the materials used and Wood & Clay’s dexterity. 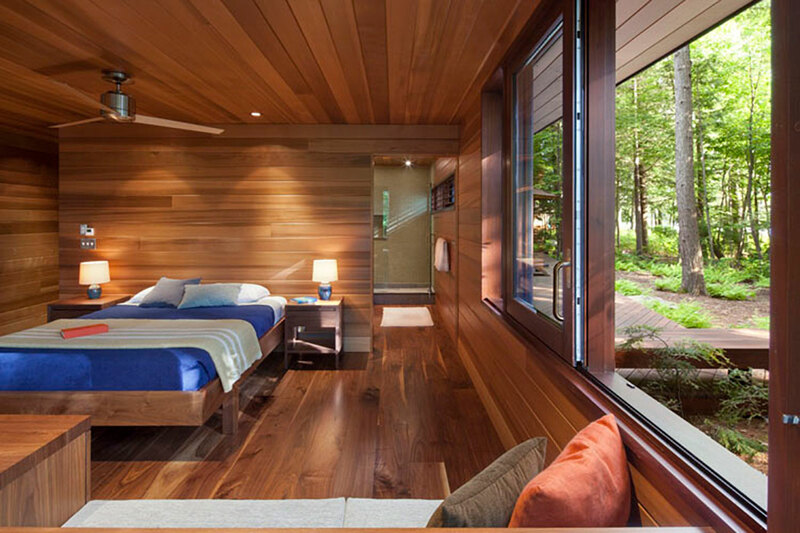 Every room brings communing with nature to the next level, with refined interiors that reflect and pay homage to the beauty of the natural wooded terrain just beyond its walls. Main image: Wood & Clay, Inc.